Summary: Elena is a maaaaaaajor Star Wars fan, so she decides to overcome her introverted nature and to get in line a few days early for The Force Awakens. It'll be just like in the news, with tons of fans bonding and having fun, celebrating their love for Star Wars, right? She ends up being third... in a line of three. Only two other superfans have decided to brave the great outdoors of the sidewalk outside their movie theatre. Between being outside on the cold cement in December in Omaha, and having to pee into a cup behind a dumpster in the middle of the night, this fan experience isn't quite what Elena had expected. But as opening day approaches, she finds that sometimes the unexpected can turn into something great. Thoughts: I wasn't sure if I was going to do a writeup about this because it's actually just a novella, but it really is a cute story, and in its 60-ish pages, it packs a lot of punch, not just about Star Wars, but about fandom, the rising popularity of nerd culture, "fake geek girls," etc. I think you'll find that, no matter what fandom you belong to, you'll identify with some of the feelings expressed by Elena as well as Gabe and Troy, the other two people in line. Also, can we just say, hooray for Elena being Vietnamese? There's no reason why she needed to be Vietnamese, but she was anyway and I love that, especially since Rowell throws in a random Vietnamese word as well (used correctly), just to bring it home. Asian people exist in the regular world too - we're not just kung fu-ing all over the place and talking about our ancestors. Vietnamese girls are Star Wars fans too. So yeah, I loved this, because Elena didn't HAVE to be Vietnamese from a plot standpoint, but at the same time, she needed to be Vietnamese because there just need to be more POC, especially as protagonists and especially in realistic (ie, non-fantasy, non-period, non-supernatural) fiction. I didn't realize how much I needed her to be Vietnamese until it was mentioned, because I don't often see people like myself represented in "regular" fiction. 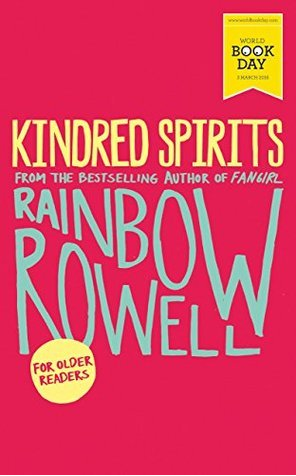 I'm not sure if this novella is widely available yet, but I know it will be at some point, and I highly recommend checking it out if you're a Rainbow Rowell fan, or even if you're a fan in general, since it's a story about fandom.